After a long holiday hiatus, I'm finally back in the megalopolis and ready to blog in 2008. Here are some of the highlights of our hectic, but fun Texas vacation. 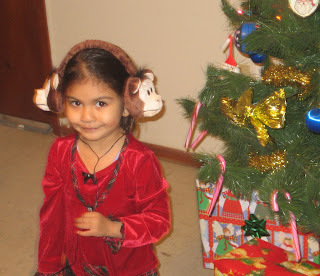 My niece Micaela wears her Christmas monkey headphones at my parent's house in Eagle Pass, Texas. 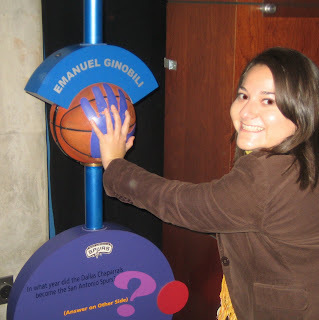 I had to compare the size of my hands with those of everyone's favorite Spur Manu--before a game in San Antonio. 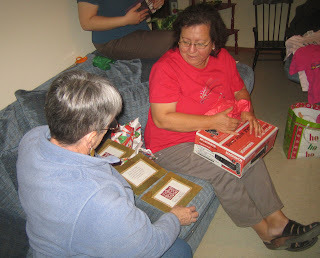 This was the first year that my mother-in-law Cathy joined the Flores family for our production of a "Very Border Christmas," filled with lots of eating, quick trips to Piedras Negras, dominoes, brain teasers and karaoke. My first taste of tamales during the holiday season was at my friend Brandon parent's house in San Antonio. His family gathers in the wee hours of the morning and cooks all day. The results? Delicious! !